The Violinist of Versailles, part 2. Words of a stranger. I never met her. I didn’t even know her name; so, I dubbed her The Violinist of Versailles. Her small violin and her even smaller hands brilliantly played the notes that touched the deep places of my heart. She closed her eyes, and her little angelic face demonstrated how to play simply for the love of the music. Pure emotion. Pure intuition. She taught me something that day. As a writer, it’s quite easy to get caught up in varied definitions of success–books sold, or contracts secured. This career path threatens daily to become a tally sheet of rejections. Since I saw her, the Violinist of Versailles, I have been reminded to close my eyes, shut out the audience and the critics, and let my fingers translate the images that play like a movie real inside my head. To write simply for the love of the craft as she played for the love of the music. I wrote about her, how she touched me that day and I thought it ended there. But, for reasons beyond my comprehension, the story has grown. After posting a blog about the Violinist of Versailles, and telling my story of that day, I received a remarkable email. It seems only fitting that the one who penned the email should be allowed to share his story in his own words. Here is the email I received. My time never seems to be my own. 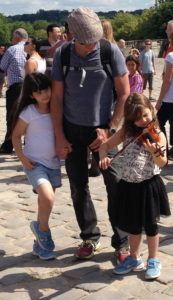 With two daughters, Jordi now 6 and Ali now 8, I spend much of my free time focusing them on practicing their music. When we’re not practicing, I patiently bide my time at The Conservatory awaiting the conclusion to their lessons, practices and rehearsals. Most of the time it is like corralling feral cats. Making things worse is that this is the pre-summer concert, examination and competition season. The busiest and most stressful musical season of the year. Bored, I sat by myself in a giant concert hall this past Saturday. A thumbnail orchestra of miniature musicians was on stage, and I was working very hard to ignore them as they repeatedly practiced snippets of the great masters. Accompanied by the frenzied grunts and noises of the concert leader, Bach and Beethoven washed over me, and I was intentionally oblivious. As Ali was called to the piano to accompany Jordi on the violin to rehearse Paganini for their upcoming concert I was intentionally oblivious. My self-imposed ignorant bliss was disturbed when they yelled at each other, snipping about tempos, cues, and rhythm. While the Instructors got them back in line, for some reason glancing at me disapprovingly, I consciously tried to melt into my seat and disappear while I began an in-depth inspection of the contents of my cell phone. The sounds of their music retired to the background of my consciousness, and although the reason why I leave work early to bring them to music was plain as day and resounding in my ears, it somehow escaped my attention. I was searching my phone for a particular picture, but in my distraction I searched the internet instead. Rather than viewing the photograph I was looking for on my phone, I found myself reading your blog on the Violinist of Versailles. As I read your words, the beauty of my daughters’ music began to surface from where I had pushed it into the background. Somehow with all the rushing, coaching, teaching and practicing I had lost focus of the reason why. What you describe was familiar to me, and as I approached the end of your blog their music roared in my head like a storm, undeniable and insistent. Your words reminded me of their brilliance – a brilliance of which even they are unaware. Little girls who are made of music, to the point that they even sing in their sleep. When I finished reading your blog I viewed the picture of the Violinist of Versailles. Then I looked at the stage, and there she stood in real life before me. Eyes closed, miniature violin under her chin creating the music of the angels. The Violinist of Versailles. I don’t mean this figuratively – I am being quite literal. Jordi is your Violinist of Versailles. And your words, words from a stranger whispered into the wind, found their way home and reminded me of the value of the hours, days, weeks expended by these two little girls in perfecting the art that is their music. I will never forget our experience standing in line at Versailles. Jordi won’t travel anywhere without her violin, and that day was no different than any other in that respect. She was only five last summer, and although she was used to playing to large audiences at concerts, the huge crowd of people in line on the cobblestones was very intimidating. Standing in the sun with no shade, having pre-purchased tickets just to stand in that lineup, everyone seemed so upset and dejected, and Jordi just wanted to cheer them up. Although it sometimes recedes to the background of my recollection, I will always remember my pride at her concert at Versailles. But, like writing, music sometimes feels solitary. With electronic media it is even less personal – broadly distributed, its worth sometimes feels diluted. It is easy to lose sight of the fact that your art touches an audience. It is difficult at times to comprehend the size of the audience, or foresee the effect it will have on that audience. Thank you for sharing your feelings about how Jordi’s music touched you. You have returned the favour – I am your audience, and your words have now touched me. As I read this email, tears fell down my cheeks. “Words from a stranger.” I’m afraid I cannot portray such a profound moment in the magnitude it deserves. Maybe if I could it would no longer be profound. I don’t know. But I do know this–we are all strangers and our words have the capability to soar and move above the ancient ground upon which we tread. Just like the notes Jordi played that day in Versailles. I still have never met her, but she has a place in my heart. Notes and words strung together like bits of yarn and twigs to build a sort of nest in my heart for memories to live. I’m grateful for words from a stranger. Thank you, James, for your words likewise whispered into the wind. And thank you Jordi, for sharing the unforgettable that day. I remember saying that just the other day. Chances are I was being sarcastic, but the profundity reverberated back and hit me square between the eyes. Indeed, life is a teacher. Not teacher as in fourth grade, double check you did your spelling homework, kind of teacher. More like, ancient college professor who doesn’t care or even seem to notice if you show up for the oft monotone lectures on the bonding of atoms, kind of teacher. I think our tendency is to want to be the teacher. We dominate our to do lists. Strive for accomplishment. Paint a reality that leads us to believe we have any control over anything. We steal the pointer from the decrepit instructor and we point it around and tell the circumstances in the room who’s the boss. Our children have been raising lambs for 4H. And long story short, we had to put one of them down last night. All of us have grown to love the gentlest lamb in the bunch. This culture of winning and striving and controlling has provided a great deal, but it has left us barren in the face of death. Death is also a teacher. 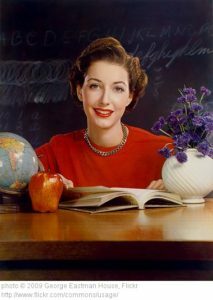 Only this teacher doesn’t surrender her pointer stick or her podium. When she speaks, we are silent, and as her voice whispers a final breath, all our accomplishments and striving and control are rendered mute. The words we use in the classroom of life have no bearing in the silence. But if we can be silent for a few moments in death’s classroom, we witness a great paradox. In a few words, death teaches us about life. She points to our aimless strivings and our lust for control. She draws us back to reality. The reality that declares the only control we may have is over ourselves–our words, our actions. She teaches us how to live better. To live in honesty and vulnerability. To live in reality.